Community 1st Oldham development Chadderton Wellbeing Centre has received national recognition at the prestigious annual LIFT Awards by winning the Sustainability Award. The LIFT Awards recognise the commitment, innovation and dedication of the LIFT industry in delivering high quality infrastructure and health services to local communities, and the Sustainability Award is given to the project that best demonstrates how outstanding sustainability has been embedded in the design, construction and operation of the building. The sustainable features at Chadderton Wellbeing Centre include a rainwater harvesting system, solar shading, increased thermal insulation and, most notably, an innovative Green2Go Combined Heat and Power (CHP) generating system, which is powered by a bio-fuel based 100% on waste used cooking oil and provides all the heat and power requirements for the building. Uniquely, surplus power can be exported to the National Grid, allowing even greater off-setting of emissions. Green2Go collects waste used cooking oil from commercial and public sector buildings, such as schools within the Oldham area, to be reused as a bio-fuel source to help power this public building. Collectively, these features have resulted in an ‘A’ rated energy performance certificate, which shows how energy efficient the building is. This is one of the highest ratings available and demonstrates the impact of the ground breaking technologies which exist in the building which are resulting in an estimated cost effective reduction in the building’s carbon emissions of approximately 450,000 kg per year. 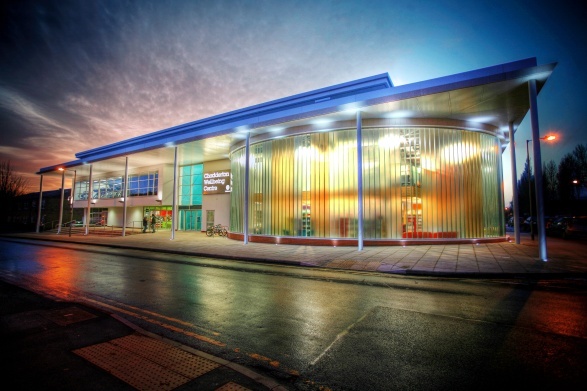 Community 1st Oldham are currently working towards an ‘A+’ rating, which is the highest energy performance rating available, and are confident that the Chadderton Wellbeing Centre would be the first public building to achieve this accolade. This entry was posted in Achievements and Accolades, News. Bookmark the permalink.